In the freezing month of January 1951, an extraordinary collection of people gathered in Paris, France, for a conference with the title ‘Les machines à calculer et la pensée humaine’ (Calculating machines and human thought).1 The conference was held at the Centre National de Documentation Pédagogique, 29 Rue d'Ulm, with support from the Rockefeller Foundation. The organising committee was chaired by Joseph Pérès, director of the Institut Blaise Pascal (IBP) and included Louis Couffignal, director of the IBP's Laboratoire de Calcul Mécanique (Mechanical Calculation Laboratory, which in fact concentrated on digital techniques) and several more junior helpers. 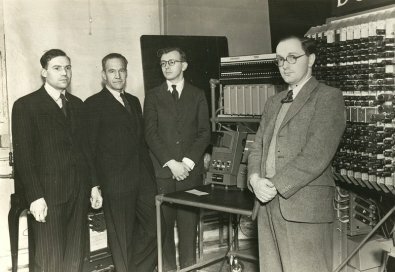 The IBP was founded in 1946 and existed until 1969, its history well documented by Mounier-Kuhn.2 Couffignal had spotted the importance of binary calculation in the 1930s, and in 1946 he visited the USA and saw the ongoing work there, notably ENIAC. It seems that he had all the right contacts to organise an important and successful conference. Those present included most of the leading computing pioneers in Europe, and several from the USA, the leading cyberneticists, and a number of neurologists. Surely this blend of topics and specialists should have been an earth-shaking meeting from which great ideas emerged, but it has passed largely unnoticed outside France. This article outlines the contents of the conference and speculates, needless to say with the benefit of hindsight, about why it failed to reach the synthesis that we might have expected from such a dialogue between the emerging disciplines of neuroscience and computer science. In that January only a few years after the war, Paris was no doubt gloomy and cold3 but was probably a welcome change for the some 40 British participants at the conference, escaping from strict food rationing and all the other privations of British life at that time. France was also still suffering from rationing, but Couffignal, with his supplementary job as Inspecteur de l’Enseignement Technique, at least managed to arrange a closing dinner catered by the Ecole Hôtelière de Paris, which must have been a real treat for the participants. All the same, given the restrictions on travel and foreign exchange in those days, the conference must have been considered of extraordinary interest for so many to cross the English Channel. There was a total of about 270 participants, mostly from France but more than 60 of them from other countries: Belgium, Brazil, Britain, Germany, Italy, the Netherlands, Spain, Sweden, Switzerland, the USA and Yugoslavia. There was a mixture of scientists, engineers, and about fifteen neurologists or doctors. A few journalists were present too. The local participants included several listed as ‘Calculatrice’ (computer), who were of course skilled operators of calculators, a female occupation in France as in most countries at the time. In modern French, an electronic computer is ‘un ordinateur’4 but ‘une calculatrice’ was also in use at least into the 1970s, after which it came to refer only to small calculators. It seems worth listing some of the more notable names, in alphabetical order, with their attributions in 1951, and a few notes on those not well known to historians of computing. W. Ross Ashby (Department of Research, Barnwood House, Gloucestershire, UK) – Britain’s cyberneticist. Andrew D. Booth (Birkbeck College, London). B.V. Bowden (Ferranti, UK) – He was the editor of the influential 1953 book Faster than Thought. Bowden himself wrote the chapter on Thought and Machine Processes, but made no reference to the Paris conference. In due course he became Minister for Education and Science and Baron Bowden, of Chesterfield in the County of Derbyshire. Louis de Broglie, Secrétaire Perpétuel de l'Académie des Sciences, Paris, an important physicist who had become interested in cybernetics. F.M. Colebrook (National Physical Laboratory, UK) – the man who brought the ACE project at NPL to fruition. W.S. Elliott (Elliott Bros, UK) – Bill Elliott, head of Elliott Brothers’ Computer Division at Borehamwood. Pierre Germain (assistant at the University of Brussels). In 1951, he was an assistant to the applied physicist P. Kipfer, helping to build an analogue computer for solving Laplace equations. He also contributed to Couffignal’s project. Joining CERN in 1955, he became Leader of the Proton Synchrotron Machine Division in 1961, and continued in senior positions at CERN until retirement. D.R. Hartree (Cavendish Laboratory, University of Cambridge). S.H. Hollingdale (Royal Aircraft Establishment, Farnborough, UK). Tom Kilburn (University of Manchester). W.S. McCulloch (University of Illinois) – whose 1943 paper5 with W.H. Pitts made the link between neurology and Turing machines. Jacques Maisonrouge (IBM, Paris – later to be head of IBM Europe). Benoit Mandelbrot (Philips, Paris – where he was employed as an engineer on colour television development from 1950 to 1953). Eduard Stiefel (Institute for Applied Mathematics, ETH Zurich). G.C. Tootill (Royal Military College of Science, Shrivenham, UK, also ex-University of Manchester). A.M. Uttley (Telecommunications Research Establishment, Great Malvern, UK). Alwin Walther, Technische Hochschule Darmstadt, the lone German. He became one of the first computer scientists in Germany, building the ‘Darmstädter Elektronische Rechenautomat’ (DERA) from 1951 to 1959, and in due course, with his colleague Heinz Unger, he supervised the 1962 doctoral dissertation of one Carl Adam Petri in which Petri nets were first proposed. W. Grey Walter (Burden Neurological Institute, Bristol, UK) – Britain’s other cyberneticist. Adriaan van Wijngaarden (Mathematisch Centrum, Amsterdam) – later considered the founding father of Dutch computer science. Norbert Wiener (MIT) – America’s cyberneticist. Maurice V. Wilkes (Mathematical Laboratory, University of Cambridge). F.C. Williams (University of Manchester). John R. Womersley (British Tabulating Machines [BTM], UK) – previously the man who hired Alan Turing to design the ACE at NPL. The more technical participants came from a wide variety of academic, research and government establishments, and from industry. Ferranti led the industrial charge with eight people; IBM came next with four. Other companies present included BTM, Logabax, Elliott Bros, Machines Bull, Powers-Samas (UK), Powers Tabulating Remington Rand (Brussels), SA des Machines à Statistique Powers (Paris), Philips, and Plessey. Logabax had the contract to build Couffignal’s planned machine, but they went bankrupt in 1952.2 Logabax was also associated with Elliott Bros,8 who eventually supplied an Elliott 402 machine to the IBP in 1955.2 The Société d’Electronique et d’Automatisme, which was developing the first digital computers in France, was also represented. There were thirty-eight presentations in all, only some of which will be mentioned here. The opening speech was by a grand old man of French science, Louis de Broglie, son of a noble family who ended his days as a duke. In fact he was only 58 at the time of the conference, but his Nobel Prize in physics dated back to 1929. His introductory remarks were outside his original area of expertise, and were possibly drafted for him by the conference organisers. He discussed analogue and digital calculators, and the analogy between the nervous system and both servo-mechanisms and mathematical machines. De Broglie correctly identified the difference between precise calculating machines (as pioneered by Pascal himself) and approximate analogue machines. He characterised current activities (in 1951) as mainly oriented towards the latter. That was probably objectively true, but of course the future of analogue computing was limited. Although de Broglie recognised the growth of electronic machines, he missed the main point: the future lay with stored-program digital machines; essentially with Turing, not with Pascal. What is startling by its absence, to modern eyes, is any reference to programmable machines, Turing machines, or for that matter to Turing’s Mind article 'Computing Machinery and Intelligence'9 – only a few months old, but surely a key publication for the topic of the conference. Unfortunately the same lacunae underlay much of the six-day conference. Turing’s absence from the meeting seems worthy of comment. Somehow, one would have expected him to be there. During 1950, he and Claude Shannon had renewed their wartime discussion of intelligent machinery and Turing had also met McCulloch, Uttley, Grey Walter and Ross Ashby during the year.10 The conference might have been very different if his and Shannon’s thinking on machine intelligence had been presented. But Turing’s interests were just then switching towards his final great work on morphogenesis, and he was eagerly awaiting the delivery of the Manchester Mark I computer. At the time, the fundamental importance of the Turing machine was not widely understood. We know of at least three people in the audience – Hartree, McCulloch and Womersley – who had definitely read 'On Computable Numbers'11 by 1951, and there were certainly others. However, for many machine builders, the reference document was in fact von Neumann’s First Draft of a Report on the EDVAC,12 which contains no citations whatever, although von Neumann himself was completely familiar with 'On Computable Numbers'. Alternatively they used practical information from the Moore School Lectures of 1946. In any case it is clear that the majority of those present did not appreciate the vital importance of stored-program machines, and – judging by the published record – those who did appreciate it did not say so. In Section 1 of the conference, there were talks about the big machine projects of the day: Aiken on the Mark IV (with twenty photographs); Booth on ARC, SEC, and APEXC; Eduard Stiefel (ETHZ) on the Zuse Z4; F.M. Colebrook (NPL) on the Pilot ACE; Williams and Kilburn on current work in Manchester – the Ferranti Mark I was on the point of delivery to the University. Colebrook, working for a Civil Service establishment, was careful to speak respectfully of Womersley, Booth, Williams, Uttley, Aiken and the absent Turing. Colebrook seems to have been the only speaker who even mentioned Turing in passing. In Section 2 of the conference, the talks by speakers including van Wijngaarden mainly covered the emergence of machine-based numerical analysis, a very important topic that was the main public justification for all digital computer projects at the time. A talk by Wilkes was placed in this section, describing experience with EDSAC and discussing numerical analysis subroutines at some length. This demonstrated Cambridge’s leadership position at the time: his was the only talk about what had already been achieved with a digital electronic computer, and he even covered the practical organisation of machine operations. Section 3, supposedly covering the nexus of machines and the nervous system, should have been the most exciting part of the conference. It was, however, rather a mish-mash of unconnected talks. For example, Gonzalo Torres-Quevedo presented his father’s machines: a chess-playing machine dated 1911, another from 1921, a ‘télékine’ from 1905 (a wireless remote control), and a ‘fusée sans fin’ from 1895, ‘fusée’ in the unusual sense of ‘spindle’, so this was in fact a form of analogue calculator. Grey Walter presented his cybernetic ‘tortoises’, which were certainly a novelty at the time, with their apparently purposeful behaviour.6 McCulloch presented a thoughtful paper actually comparing calculating machines with the brain, perceptively noting the brain’s enormous advantage of massive parallelism. He also discussed how the nervous system was understood to work in 1951 (action potentials and so on). Professor H. Gastaut (Faculté de Médecine de Marseille) also tackled the nominal subject, but largely with reference to Plato and Descartes. Then Norbert Wiener spoke about calculating machines and the Gestalt, but it is hard to find much substance in the paper. Realistic approaches to pattern recognition still lay far in the future. A. M. Uttley simply spoke about implementing logical operations in a computer. To some this may have been a surprise, as most early machines and applications were focussed on arithmetic operations in support of numerical analysis; cryptanalysis, which needed logical operations, was not discussed in public in 1951. However, one should not forget that George Boole entitled his major book on logic ‘An Investigation of the Laws of Thought,’ so Uttley was certainly addressing the intended topic. To follow this, Ross Ashby talked about the homeostat, his self-regulating machine made out of war-surplus bomb controllers. Like Grey Walter’s tortoise, this provided a nice illusion of directed behaviour. Several talks by neurologists were followed by Couffignal’s closing talk, entitled ‘Some new analogies between the structures of calculating machines and cerebral structures.’ Like Ross Ashby and Grey Walter, he seems to have been seduced by the tricks that simple feedback circuits and logic gates could do – his diagrams are reminiscent of those of McCulloch and Pitts5 and for that matter of those used by Turing in his ACE design15 – but his only ‘big machine’ reference is to ENIAC. Quite clearly, even preparing his talk for publication after the conference, he still missed the main point of stored-program machines. On the other hand, he managed to include a reference to the recently invented transistor, and its analogy to what was then understood about synapses. Apart from de Latil’s successful book, there is little to suggest useful outcomes from this conference, despite its enormous potential and high-powered speakers. What was the problem? Firstly, there was a general lack of recognition that stored program computers (Turing machines, or von Neumann machines as many people already thought of them) would change everything. Couffignal apparently didn’t fully understand this; the programme committee probably didn’t understand it; none of the speakers and discussants referred to it. It must have been frustrating for the few who did understand. The issue was not really a matter of abstract mathematical theory; for example, Wilkes’ emphasis on the subroutine library was entirely pragmatic, and entirely based on the stored program. Yet no discussion of his talk, possibly the most practical one of the whole conference, was noted in the proceedings. One suspects that language difficulties may have limited the debates – the proceedings are presented as if everyone spoke and wrote immaculate French, but many of the speakers were certainly not fluent. The result was that the analogies drawn between machines and the nervous system were mainly reductionist, with a focus on logic gates and synapses: nobody, with the possible exception of McCulloch, sketched the big picture. Secondly, there were mixed objectives. This was an early instance of the ‘mad inventors and untrustworthy engineers’ problem belatedly identified in 1969 by John Pierce16 that hurt pattern recognition, and artificial intelligence in general, for several decades. For Pierce, researchers tended to rely on individual inspiration (the ‘mad inventor’) or on untested methods (the ‘untrustworthy engineer’), instead of evidence-based scientific analysis. Both of these errors can be identified in the conference proceedings. The basic science of neurology and brain function was very limited in 1951, and the engineering of digital computers was still experimental. Confusion of thought when considering these two disciplines together was almost inevitable. Of course, it is easy sixty years after the event to diagnose this confusion, but it was natural enough at the time. Finally, despite 'Computing Machinery and Intelligence' having been published the year before9, Turing’s and Shannon’s clarity of thought about what became the study of artificial intelligence was missing. Thus, the opportunity to truly characterise the relationship between programmable computers, machine intelligence and human thought, to the extent possible in 1951, was missed. It was another five years before the founding artificial intelligence conference took place in the USA, by which time Turing was sadly dead. Nevertheless, in Mounier-Kuhn’s opinion13, the conference helped to establish numerical analysis in French academia, thus favouring the development of digital computing, and it was therefore the first meeting in France of what later became the national computing community. This in itself was an important result. Pierre Mounier-Kuhn was kind enough to comment incisively and helpfully on an early draft of this article, and provided several useful references. Any remaining mistakes and misunderstandings are those of the author alone. 1 Les Machines à Calculer et la Pensée Humaine, Colloques Internationaux du Centre Nationale de la Recherche Scientifique, Vol. XXXVII, CNRS, Paris, 8-12 Janvier 1951 (published 1953). 2 Pierre E. Mounier-Kuhn, The Institut Blaise-Pascal (1946-1969) from Couffignal’s Machine to Artificial Intelligence, Annals of the History of Computing, 11(4) 257-261 (1989). 3 Guillaume Séchet, Les chroniques météo de l'année 1951, http://www.meteo-paris.com/chronique/annee/1951 (link verified October 2015). 4 Étymologie du mot ORDINATEUR, http://apfa.asso.fr/motdor/etymolog/ordinate.htm (link verified October 2015). 5 W.S. McCulloch and W. Pitts, A Logical Calculus of the Ideas Immanent in Nervous Activity, Bull Math Biophysics 5 115-133 (1943). 6 Margaret Boden, Grey Walter's Anticipatory Tortoises, The Rutherford Journal 2 (2006-2007), http://www.rutherfordjournal.org/article020101.html (link verified October 2015). 7 Jacques Lethève, La profession de bibliothécaire est-elle menacée de disparaître?, Bulletin d’Informations de l’A.B.F., 79-83 (1960). 8 John Hendry, Innovating for Failure: Government Policy and the Early British Computer Industry, MIT Press, 1989. 9 Alan M. Turing, Computing Machinery and Intelligence, Mind (59) 433–460 (1950). 10 Andrew Hodges, Alan Turing: The Enigma, Burnett Books (1983). 11 Alan M. Turing, On Computable Numbers, with an Application to the Entscheidungsproblem, Proc. London Math. Soc. Series 2 (42) 230-267, (1936-37). Correction, ibid, (43) 544-546. 12 J. von Neumann, First draft of a report on the EDVAC (June 30, 1945), Contract No. W-670-ORD-4926. Moore School of Electrical Engineering, University of Pennsylvania (1945). 13 Pierre E. Mounier-Kuhn, personal communication, November 2013. 14 F.-H. Raymond, An Adventure with a Sad Ending: the SEA, Annals of the History of Computing, 11(4) 263-277 (1989). 15 Alan M. Turing, Proposed Electronic Calculator [also: Proposals for Development in the Mathematics Division of an Automatic Computing Engine (ACE)], NPL internal report E882, 1946. Reprinted as NPL Technical Report Com Sci 57, April 1972. Reprinted in Brian E. Carpenter and Robert W. Doran (editors), A.M.Turing’s ACE Report of 1946 and other papers, Vol. 10 in the Charles Babbage Institute Reprint Series, MIT Press, 1986. 16 J.R. Pierce, Whither Speech Recognition?, letter to the editor, Journal of the Acoustical Society of America, 46 (4) (Part 2) 1049-1051 (1969). 17 Simone Schall, The Mind Thinks in Embodied Metaphors, in John Brockman (ed. ), This Explains Everything, Harper Perennial (2013). 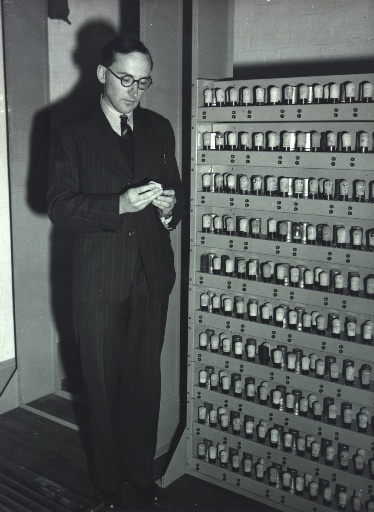 Maurice Wilkes and an EDSAC rack. © Computer Laboratory, University of Cambridge. Reproduced by permission. Kilburn standing at the console of the Ferranti Mark I computer at Manchester University. Seated are Ferranti engineers Keith Lonsdale (left) and Brian Pollard. Courtesy School of Computer Science, University of Manchester.